We have been providing our clients throughout greater Northern San Joaquin Valley and the East Bay area with creative natural stone rockscapes. There really is nothing like the look of some beautiful large landscape rocks and stones to enhance the natural appeal of your outdoor areas. 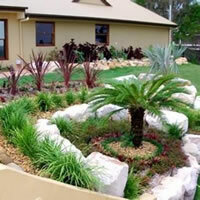 Landscape boulders will make a great statement when added to your existing landscape setting. Or perhaps you are building a completely new landscape and want to have boulders as a main feature throughout? The team at Design West Landscaping will come out to your property and recommend the best type of boulders to complement the rest of your hardscape and softscape surroundings. Boulders can make a great border for your flower beds and gardens. Or perhaps you would like us to use boulders when creating your waterfall or pond feature. There really is no limit to the effects that boulders can have on your landscapes. Let our professionals add a special touch with the addition of landscape boulders! Flagstone is quickly becoming a very popular type of natural stone used for a wide variety of landscaping applications. We have seen an increase in the request for flagstone patios, walkways and paths. This involves the use of flagstone pavers. They add an elegance and 'old world' appeal with a range of natural tones, colors and textures. Because flagstone is such a unique and costly natural stone it is best to leave the handling and installation to a professional company like Design West Landscaping. This way you will be rest assured knowing that we will get the job done right and efficiently the first time with little to no waste. Let us create a flagstone feature in your landscapes that you will enjoy for many years to come! When creating any type of rockscape, the types of landscape rocks you use will greatly impact the final result. Let our team of experts show you a range of natural stones and rocks that will make the perfect rockscape for your property. Our professional landscape designers have been including landscaping rocks in their designs because of the beautiful natural appeal that they invoke. Landscape rocks and stones have so many applications within a landscape setting. They are used as borders, accents and in the building of rock features and water features. Talk to us today and we will help you realize your natural stone visions. If you want a natural looking landscape then let Design West Landscaping add some really beautiful boulders, flagstone and rockscapes to your landscapes. Contact the team at Design West Landscaping today and we will provide you with a personal consultation on your next landscaping project, feel free to browse our project gallery for some inspirational ideas!